The Great Places in Missouri program was started in 2014 to recognize neighborhoods, streets, and public spaces throughout Missouri that demonstrate exceptional character, quality and planning that enrich communities, facilitate economic growth, and inspire residents and visitors alike. The Great Places in Missouri program was modeled after APA’s Great Places in America Program that has recognized 290 neighborhoods, streets, and public spaces around the country since 2007. APA Missouri will recognize the 2019 Great Places in Missouri designees at a ceremony on March 6, 2019 at 11 a.m. in the State Capitol Rotunda in Jefferson City. Downtown Lee’s Summit is the recipient of the Great Neighborhood in Missouri award. 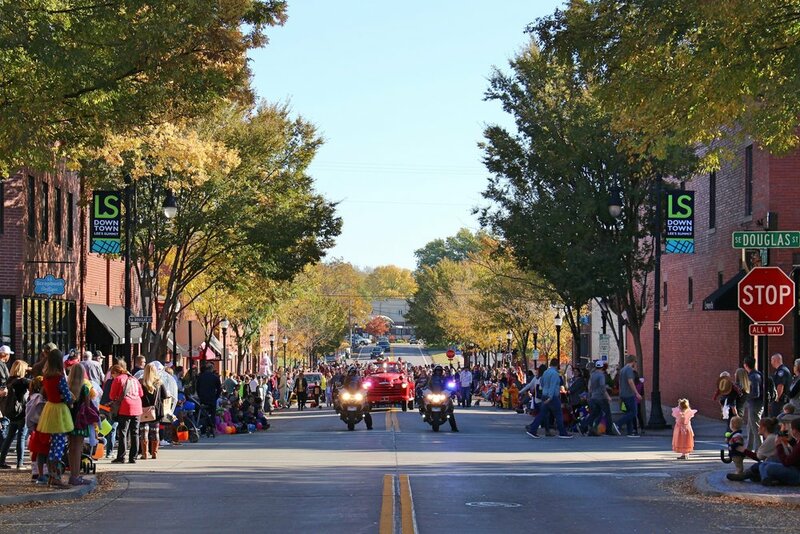 Planning efforts began in 1989 to revitalize downtown Lee’s Summit with business leaders and the City forming Downtown Lee’s Summit Main Street to give a common voice and vision for the downtown stakeholders. This newly formed group led efforts to develop The Vision of the Heart Study in 1993. This plan provided recommendations for façade and streetscape improvements, laying the foundation for a community bond issue of over $13 million. These funds allowed for the replacement of utilities, wider sidewalks, trees, and pedestrian lighting. The adoption of Old Lee’s Summit Development Master Plan in 2004 led to actions such as the construction the new Lee’s Summit City Hall in downtown, affirming the commitment of the City to keep downtown a civic center of the community. With substantial downtown development occurring, downtown design standards were adopted in 2013 to help ensure new infill is consistent with the character of existing structures. The Downtown Lee’s Summit Community Improvement District was formed in 2014 to assist in funding public services and improvements for continued preservation, promotion, and enhancement of the downtown. New bike racks, enhanced marketing, streetscape maintenance, and planning for a future community pavilion have resulted from the development of the community improvement district. Downtown Lee’s Summit has flourished with over 520 net new jobs and 73 new businesses over the last decade and a vacancy rate of 0% with new mixed-use infill projects on the horizon. Downtown Lee’s Summit is a model example of how planning can create a great neighborhood and civic center with opportunities for employment, recreational activities and festivals, and housing. Silver Moon Plaza in Chillicothe, Missouri is honored as a Great Public Space in Missouri. This single lot oasis in the heart of Chillicothe is an excellent example of planning in a small community. A result of the Missouri DREAM Initiative, Silver Moon Plaza was a vacant lot and eyesore on the courthouse square, in the early 2000’s, but has been transformed into a dynamic and active community space. In 2009, the community and planners worked through a process to identify desirable uses for the lot. The final plan and subsequent design and engineering resulted in Silver Moon Plaza. The plaza is a go-to location for prom and senior photos, marriage proposals, weddings, band and choir performances, parades, downtown festivals, and seasonal holidays. Community members use the space daily for lunches, chatting on the lawn, and playing in the fountains. A true example of partnership, Silver Moon Plaza is maintained, and programmed by Main Street Chillicothe and located on land donated by a local agribusiness. The agricultural identity has been continued through the corn, wheat, and soybeans metalwork on the entry archway, the focal point of the plaza. Silver Moon Plaza characterizes a “great public space” through its plan implementation and as a gathering place for the community that reflects the character and heritage of Chillicothe. High Street in Jefferson City is the recipient of the Great Street in Missouri award. The five-block area between Adams and Broadway through downtown Jefferson City is a vibrant capitol corridor. Many years of planning has maintained the historic character of High Street, while still attracting new businesses. Jefferson City’s 1996 Comprehensive Plan specifically highlights High Street with a focus on the need for economic growth. To implement the plan, the City revised the zoning code in 2002 and created a zoning district for High Street and the downtown. The zoning aims to promote density and dimensional standards of residential and commercial uses desired in a downtown setting. The focus on mixed-uses allows people to live among the rich history of Missouri’s capital city and enjoy a lively downtown scene with numerous festivals and year-round activities. A partnership between the City of Jefferson and the Jefferson City Downtown Association has enabled historic preservation through programs such as a commercial façade improvement, which has been utilized by 47 local business owners. High Street was also designated as a bicycle pathway in the regional 2016 Capital Area Pedestrian and Bicycle Regional Plan. This plan has led to the introduction of sharrows and ornate bike racks. High Street is multi-modal and accessible with a dockless bike share, electric scooters, public transit lines, complete street elements, mid-block crossings and bulbouts, all ADA accessible. High Street exemplifies a truly great street, well-planned and person focused with a strong history. The Missouri Chapter of the American Planning Association (APA) represents more than 600 professional and emerging planners across the state of Missouri. The APA is an independent, not-for-profit educational organization that provides leadership in the development of vital communities. APA and its professional institute, the American Institute of Certified Planners, are dedicated to advancing the art, science and profession of good planning – physical, economic and social- so as to create communities that offer better choices for where and how people work and live. Members of APA help create communities of lasting value and encourage civic leaders, business interests and citizens to play a meaningful role in creating communities that enrich people’s lives. For more information, visit www.planning.org and www.apamissouri.org.